Over 3.6 million tons of maize are required annually to feed Kenya. With more than 2 million hectares (ha) of Kenya’s land under small- and large-scale maize cultivation, a majority of Kenyans depend on maize as an income-generating crop. CIMMYT is leading collaborative research efforts to control the deadly disease and research with KARI. 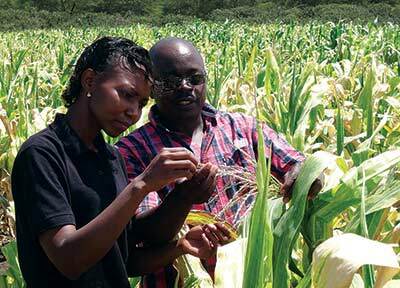 Most commercial maize varieties grown in eastern Africa are highly vulnerable to the disease. Tests in 2012-2013 found that 117 of 119 varieties artificially exposed to MLN were susceptible. However, they also identified some promising inbred lines and pre-commercial hybrids with resistance to MLN. The priority now is for these to be further developed into varieties that can be multiplied and commercialized by the east African seed industry. In September 2013, the CIMMYT-KARI partnership opened a dedicated MLN screening facility in Naivasha, in order to support the identification of maize lines and breeding materials with resistance to MLN. The facility, which was established as part of a CIMMYT-led project funded by the Bill & Melinda Gates Foundation and the Syngenta Foundation for Sustainable Agriculture, will enable scientists to screen maize germplasm under controlled and reliable conditions. Maize virologists from CIMMYT, KARI, IITA and institutions in the USA will work to optimize disease screening procedures and characterization of maize viruses causing MLN in eastern Africa. Maize-free seasons were adopted by farming communities near KARI’s Kiboko Crops Research Station, beginning in April 2014. At a meeting attended by more than 100 people in early October 2013, the farmers agreed to harvest their maize crop by the last day of February. Addressing those present, including the Makueni County administration, local community leaders, country agricultural staff, Kiboko farmers and CIMMYT and KARI scientists, district agricultural extension officer Michael Kitenje called for willingness and unity among farmers and other stakeholders to adhere to the maize-free window. He urged them to spread the message to others who did not attend the meeting: “In case you meet resistance, use your persuasive skills to make them understand the need for a community approach to controlling MLN in Kiboko,” he said. The new facility will help to ensure a continuous flow of MLN-resistant breeding material and varieties, and will serve not only CIMMYT and KARI, but other national agricultural research institutions in eastern Africa, and small- to medium-sized seed companies. It will also serve as a hub for training young African researchers and students on technologies to tackle MLN. Already, the facility has begun offering MLN phenotyping services to both public and private sector institutions in the region. A number of improved varieties with reasonable levels of tolerance to MLN have been released in Kenya, and many more resistant varieties are currently undergoing national performances trials. During the 2012-1013 cropping season, a CIMMYT-KARI team evaluated a broad range of maize germplasm for resistance to the disease. “We evaluated over 2,000 CIMMYT inbred lines and over 2,000 experimental hybrids,” explained CIMMYT pathologist George Mahuku. “We are also evaluating over 3,000 inbred lines and hybrids from seed companies and national agriculture research institutes at the MLN screening site in Naivasha,” he added. Keen to turn a challenge into an opportunity, the team is looking forward to the marketing of MLN-resistant varieties once the research is complete. 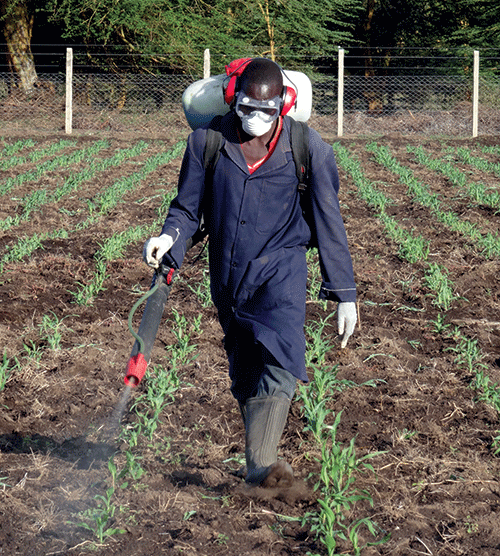 Four trials were conducted under artificial inoculation and natural disease pressure, at Narok and Naivasha. While over 95 percent of commercial maize varieties released in Kenya were found to be susceptible to MLN, some promising pre-commercial hybrids were identified, together with some CIMMYT breeding lines that showed either high or moderate resistance to the disease. The MLN-resistant lines are now being used as breeding sources to improve MLN resistance in future germplasm, as well as to convert currently susceptible but widely used CIMMYT maize lines into resistant versions. Broad collaboration is needed if MLN is to be controlled. To this end, CIMMYT and KARI organized a regional workshop for 70 scientists, seed company breeders and managers, agricultural ministry representatives and regulatory authorities from Kenya, Tanzania, Uganda and the USA in February 2013. Several important actions were identified, including surveillance, preventing movement of seeds from disease-prone areas and the use of maize-free seasons to reduce the population of insect vectors. In June and July 2013, CIMMYT and KARI organized an ‘Identification and management of MLN’ workshop for 80 scientists, technicians and skilled field staff, both from their own staff and from NARS partners in Rwanda, Tanzania, Uganda and Zimbabwe. They learned about field-based MLN diagnosis, severity scoring for screening trials and MLN management. “It is important that all the people on the ground, particularly the technicians who interact daily with the plants and supervise research activities at the stations, understand the disease, are able to systematically scout for it, and have the ability to distinguish it from similar symptomatic diseases and conditions like nutrient deficiency,” said Prasanna. Later, in November 2013, participants at a Seed Trade Association of Kenya (STAK) congress – including seed sector representatives from Burundi, India, Kenya, Malawi, Rwanda, South Africa, South Sudan and Zimbabwe – toured the new MLN screening facility in Naivasha, and were invited to submit seed to the facility for screening. “We will use lessons learned on this trip to strengthen surveillance of the disease in South Sudan,” said Cirino Oketayot, head of the research unit in South Sudan’s agricultural ministry. Speaking at the congress, Mahuku urged seed companies to recognize MLN symptoms and notify scientists should they be spotted. Looking forward, steps to tackle the disease include continuing the search for new and better sources of MLN resistance, and rapid production and dissemination of the most promising resistant material. Changes need to be made in current maize breeding ‘pipelines’ in order to remove MLN-susceptible maize types. Maize breeding populations need to be aggressively screened, and advanced testing of MLN-resistant materials is required. “Besides accelerated development and delivery of elite MLN-resistant products to farmers, our aim is also to build the capacity of regional institutions to develop robust breeding pipelines to incorporate MLN-resistant germplasm, and ensure that farmers have access to such products at the earliest opportunity,” said Prasanna. The Naivasha MLN screening facility will be aided by a second facility, also established in 2013. The stateof-the-art maize DH facility at KARI’s Kiboko research station will enable breeders to develop parental lines of maize hybrids in just two to three crop seasons, compared to seven to eight seasons with conventional breeding. While DH technology is used routinely by multinational companies, the new CIMMYT-KARI facility will make the technology available to public sector maize breeding programs, as well as small- to medium-sized African seed companies. Establishment of the new facility follows the development and release of the first tropically adapted DH inducer, jointly developed by CIMMYT and the University of Hohenheim. The development of these inducers represents the removal of an important bottleneck to the effective integration of DH technology in developing world maize breeding. In the last quarter of 2013, the new facility launched its DH production service to public (NARS) and private (small- to medium-sized seed companies) in the region. 2013 also saw the discovery of key genomic regions and promising groups of genes that confer resistance to MLN. To save time, validation and large-scale marker application for MLN resistance is now simultaneously taking place in 22 widely used and high impact, Africa adapted CIMMYT maize lines.